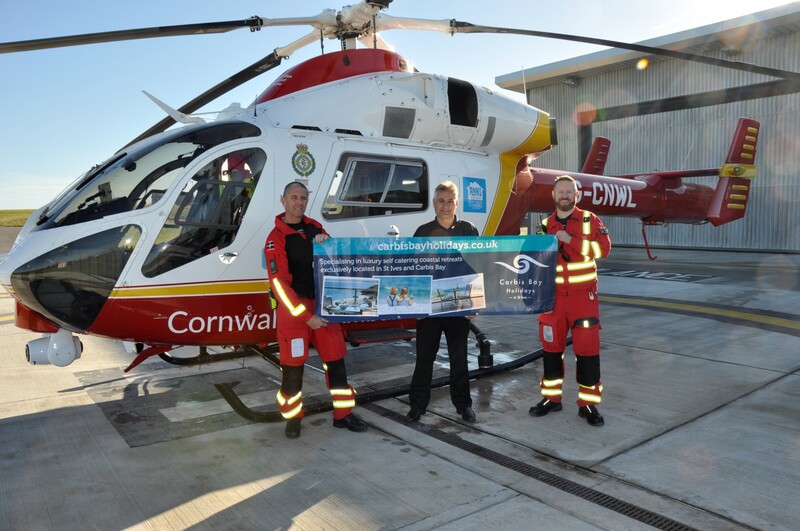 Carbis Bay Holidays has partnered with Cornwall Air Ambulance to become the first Tourism Business Supporter since the charity launched its new tourism campaign. The company will highlight the value and importance of the lifesaving charity to visitors to the county. Visitors to Cornwall make up around 20% of airlifted patients each year, yet less than 5% of donations come from the tourism sector. Steph Preston-Evans, Corporate Fundraising Officer for Cornwall Air Ambulance, said: “The charity is hoping to substantially increase donations from both tourism businesses and their customers year on year, to meet the increased costs of trying to save lives when things go horribly wrong while people are on holiday here in Cornwall. In the peak visitor months of July and August 2018, missions increased by nearly 40% compared to the same months in 2017, increasing from 173 to 241. If you have a tourism business in Cornwall, the charity needs your help. Contact corporate@cornwallairambulancetrust.org to find out more about becoming a Tourism Business Supporter or call 01637 889926. To find out how you can support the campaign and for a chance to win a VIP trip to the base- visit Carbis Bay Holidays. You can help save more time and more lives by donating here.